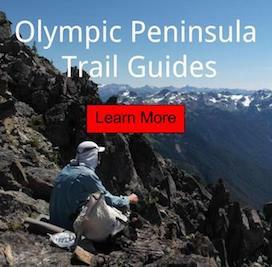 We backpacked to Tunnel Falls and then section hike the Pacific Crest Trail back to Cascade Locks, Oregon. This trip was done in spring, so logistics were a bit tricky; with the incoming weather and the fluctuation of the snow line. The popular Eagle Creek Trail is lovely. There had to be a heck of a lot of explosives used to create this walking path. It leads you to a series of waterfalls along the way. Tunnel Falls is equally splined. I was happy to have my rain gear, because of all the spray off the falls and drips from the rock wall above. We made camp near the highest point in the route, right at the snow line. It was a wet and cold night at that elevation. Dinner was a bit chilly. Then because of the weather, we called it an early night to our tents. The next morning we walked north on the Pacific Crest Trail. After a few hours we made the long descent from the high country, to the Columbia River Gorge below. Backpacking across the 'Bridge of the Gods' in the afternoon to enter Washington State on foot, that was a cool experiance. 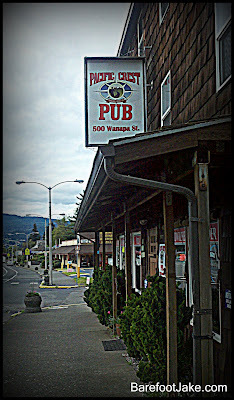 Finishing up at the Pacific Crest Pub. I had the Walking Man 'Barefoot Brown Ale'; but of coarse I did.